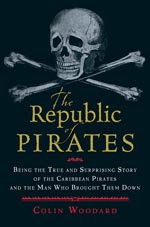 I am pleased to see news accounts stating that a potential television series based on my book, The Republic of Pirates, has been sold to NBC by Walter Parkes and Laurie MacDonald. Co-written by Jim Hart (Hook, Contact, Dracula) and Amanda Wells and executive produced by Parkes/MacDonald (Gladiator, Men In Black, Minority Report), Ted Gold and Tom Fontana (Oz, Homicide: Life on the Streets, St. Elsewhere), the drama is apparently titled -- to my pleasure -- Republic of Pirates. Deadline.com broke the news and these details with this exclusive story Thursday evening. Deadline reports it is the first drama buy for this development cycle by the new president of creative at NBC, Bob Greenblatt (Six Feet Under). As fans of the book know, Repu blic of Pirates tells the true story of the greatest pirate gang of all time, the golden age pirates who operated out of the Bahamas between 1715 and 1720 and are responsible for nine-tenths of all of our pirate pop culture imagery. The gang -- which included Blackbeard, Sam Bellamy, Charles Vane, Calico Jack Rackham, Mary Read, Anne Bonny, and the "gentleman pirate" Stede Bonnet -- founded a rogue state based at Nassau and, for a time, severed the commerce of three empires and threatened their colonies with dislocation, invasion, and rebellion. For those wanting to learn more about these pirates, the book is available in hardcover, paperback, Kindle, Nook, audiobook, Spanish and Danish editions. Links to all can be found at this page on the Republic of Pirates website.